JLC International offers the best beverage flowmeters in the industry. The flowmeters come complete with high-performance and competitive pricing. Beverage flowmeters of the Series 300-010 are designed specifically for the drinks dispense industry, including beers, sodas, and wines and are NSF approved. These flowmeters provide powerful performance with flows that can range up to 15 lpm (3.96 gpm). The meters have completely non-metallic wetted components, which makes beverage flowmeters the ideal choice for metering food-based products and even ultra-pure water. The bearings are made of sapphire to provide long life as well as reliability, wherein, the body is molded in a choice of thermoplastics (PVDF as standard). The ‘O’ ring seal is typically Viton™ but may be any elastomer. At the heart of the beverage flowmeters is a precision turbine that rotates freely on robust sapphire bearings and contains chemically resistant ceramic magnets. The principle of operation is straightforward. A jet of liquid is directed at the free running Pelton wheel turbine in a specially shaped chamber. The rotation of the rotor with its magnets is detected through the chamber wall by a Hall Effect detector. The output is a stream of NPN pulses. The output frequency of these pulses is directly proportional to flow rate and the total number of pulses the volume has passed. The frequency output is readily interfaced with most electronic controllers, displays, or recording devices. The combination of materials and technology ensures a product with a higher life expectancy and reliable operation throughout. 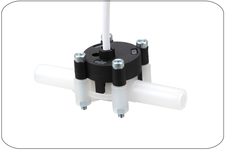 The Pulsite Solo is a stand-alone totalizer and flow rate indicator for wall or panel mount. The Pulsite is battery powered, but a dc power supply can be used, which will bypass the battery. The programming as engineering units, time base, and K-factor is simple by using the keys in the front panel with easy to follow screen prompts. It is the ideal totalizer for stand-alone monitoring of beer, wine and sodas when connected to the beverage flowmeter 300-010. JLC International not only provides these effective tools, but also has many other tools for measurement in multiple different industries. If you’re looking for the best beverage flowmeters in the industry, please look no further than our selection here at JLC International. Along with our leading products, we also provide services, including live support, to help you make the most out of your JLC International purchases. Frequency output: 235 Hz max.